Rent CNN Studio Tours Events | Corporate Events | Wedding Locations, Event Spaces and Party Venues. Host your next event inside CNN Center which houses unique space spaces for any occasion. The Atrium space is our most versatile venue. From elegant seated dinners to drop-by receptions, our event staff can help you customize this unique space to whatever you want it to be. 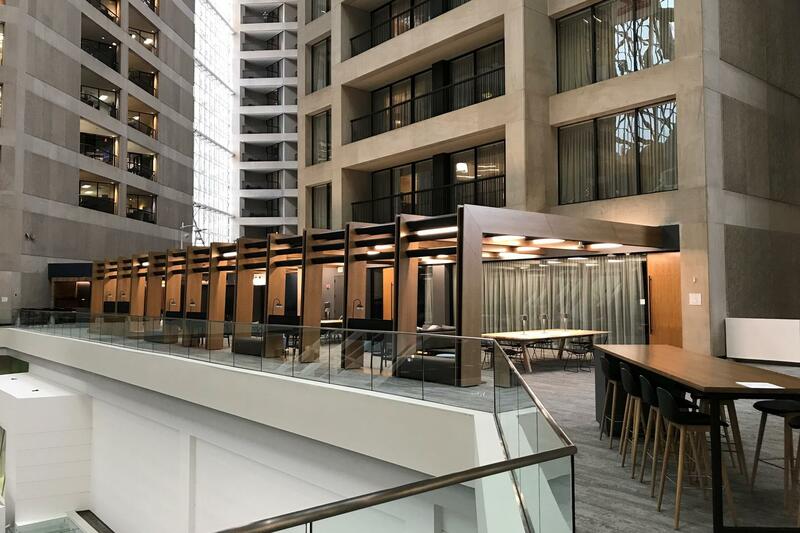 Located in the heart of downtown Atlanta, with easy access to the Georgia World Congress Center, the Atrium space allows your guests to come and go as they please, making this the perfect venue for larger gatherings. This bright and functional venue is the perfect space for medium-sized receptions. Located in the heart of downtown Atlanta, the City View space allows for your guests to freely come and go making this venue the ideal setting for drop-by receptions. Enjoy private, guided tours of CNN followed by a glimpse of the Atlanta skyline with our City View event space. With its unique views and proximity to Studio 7, this space can make a major impression on any event. Welcome your guests to the Globe for a quick cocktail before they make their way to the Terrace for their reception. Located on the 7th floor of the CNN Center, your guests will enjoy the quiet seclusion and intimate feel of our indoor terrace space. With its unique views overlooking the CNN Center Atrium, this space can make a major impression on any event. Welcome your guests to the terrace for a quick cocktail before using our premier conference room for a presentation. Afterwards, guests can enjoy relaxing in the fully furnished space while enjoying dinner or a reception. Located on the 4th floor of CNN Center, your guests will love the quiet seclusion and intimate feel of our indoor terrace space. screenings.